After an almost 30 year journey, our parish is blessed to have a new rectory. Because it meets all diocesan requirements, our new rectory can fully embrace its role as a place for quiet prayer, study, privacy and respite from stress for our current and future pastors as they provide 24/7 service to our parish – celebrating Mass, administering the Anointing of the Sick, teaching youth classes, preparing engaged couples, planning future parish development, interviewing employees, reviewing employees, counseling parishioners, taking care of the poor, arranging parish missions and retreats, and on and on and on! It has been a fascinating journey. We would like to share with you highlights of that journey as we embark on a capital campaign to replace the funds we withdrew from our account at the diocese to purchase the rectory and its furnishings, provide for some new furniture, fund modest renovations to provide a chapel, and supplement our insurance deductible crises funds. 1960’s: Mass was celebrated in the non-denominational chapel on Pawleys Island and at the Litchfield Inn. 1984: Precious Blood began as a mission of St. Mary’s Church under Father Theodore Cilwick’s pastoral guidance, but without a priest of our own. The diocese purchased 6.6 acres on Waverly Rd. A small man-made pond, a low white stucco house and a white building were on the property. 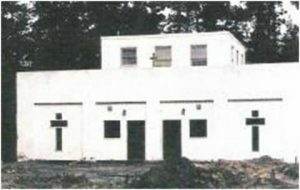 The white building, once a four-car garage and today Founders Hall, was now the Catholic church in Pawleys Island. The structure on top of the “church” was to become our first rectory. 1986: In February, the bishop issued a decree establishing the 84th parish of the diocese and naming it “Precious Blood of Christ.” Rev. Thomas Evatt, who shared his time and ministry between PBOC and St. Mary’s in Georgetown, stayed in the rectory behind St. Cyprian Church in Georgetown, because it was physically difficult for him to stay in the small apartment on top of the church. In May the diocese purchased 10.7 acres next to our property. 1988: Rev. Francis J. Travis arrived to become Precious Blood of Christ (PBOC) Catholic Church’s first fulltime pastor. While Fr. Travis was here, plans were made to enlarge the four-car garage because our parish was increasing in size. 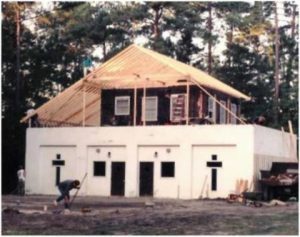 The structure on top of the “church” became our first rectory. It was a modest one bedroom apartment of approximately 400 sq. ft.
1990: Rev. Charles (Chuck) J. Snopek became pastor in October. Father Chuck purchased a home in Hagley shortly after his arrival, where he, his mother and brother lived. 1999: Fr. Chuck, due to illness, left our parish shortly after the dedication of the new church. Our parish purchased his home in Hagley for use as the rectory. Father Patrick J. Stenson (Fr. Pat) arrived and moved into the rectory in Hagley. 2000: Fr. Pat was officially appointed Administrator in August. 2005: Bishop Baker accepted Fr. Pat’s request that we sell the rectory to satisfy PBOC’s required participation in the Diocese’s Capital Campaign since our parish was also engaged in a capital campaign for a much needed Parish Life Center (PLC). The PLC campaign was successful but now Fr. Pat lived in a rented condo; not much room, no permanent space for meditation or prayer and no place for visiting priests to stay. While utilitarian, it was not a long term solution for our caregiver or visiting priests. 2006: Father Pat formed a committee to review the potential of building a rectory on the parish campus. Plans and drawings were put together to meet diocesan requirements. After a few false steps, our plans were approved. The estimated cost was around $400,000.00. The committee also looked at existing homes for sale to provide a comparative pricing/cost analysis. Homes were inspected in areas in close proximity to the parish, from Litchfield to Alston Plantation. Time passed and we were still without a permanent rectory. 2011: Bishop Guglielmone recommended to Fr. Pat to stop renting and find a permanent rectory for the parish. The process was restarted with even more intense consideration of the build vs. buy options. The decision to purchase an existing building was found to be the best option at the time for a number of reasons, including: cost effectiveness, timeliness, privacy and security. 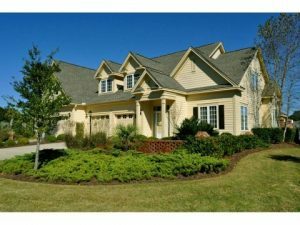 After many months of looking, we found three homes to choose from. Fr. Pat suggested we let the Diocese Building Committee make the final choice. They did and selected a condo at “The Reserve” that met all the requirements of the diocese. This decision also afforded the opportunity to sell the rectory if future conditions warranted building a rectory on our parish grounds. And that is how we came to purchase our new rectory. Taken from “Celebrating 25 Years… Remembering 25 Years; A History of Precious Blood of Christ Catholic Church 1986-2011”, photos and remembrances: Sherby McGrath. Click here for a Q&A about the new rectory.